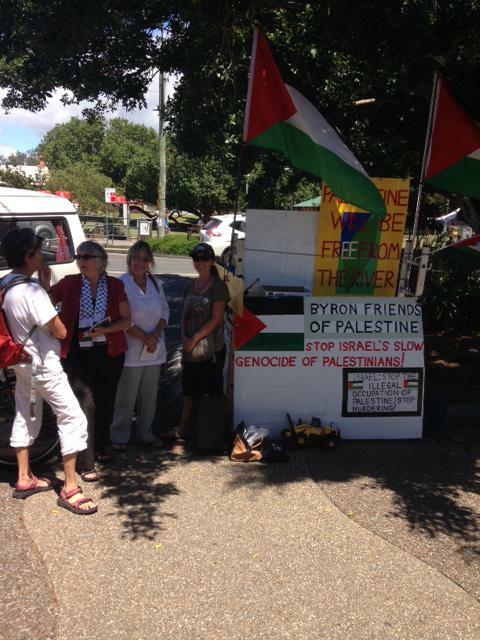 On Wednesday Byron Friends of Palestine held a stall on Jonson Street outside Fundies supporting the non-violent Boycott, Divestment and Sanctions (BDS) campaign against the apartheid Israeli state. Others were also there playing music, reading palms and selling jewellery but only we were singled out by Bob Higgins the compliance officer who ordered us to remove our stall, flags and placards immediately or a truck would come and impound everything. He admitted complaints had been received but we replied that we had had many compliments from motorists and passers by. Why do complaints trump compliments? We transferred to Australia Post property near the ANZ Bank and were left alone. Palestine’s pleas to the world for justice are largely ignored by mainstream media and most governments, including Australia, actively support Israel. However, BDS has notched up some significant victories. Veolia, for example, has pulled out of the Jerusalem light rail project and US churches have divested from Caterpillar and SodaStream. The EU does not recognise Israel’s occupation of the West Bank, Gaza, East Jerusalem and the Golan Heights which it captured in 1967 so it has passed new labelling legislation forcing Israel to identify products originating from these occupied territories. The [Israeli] army is preparing for the possibility of deploying as many as 70 reserve battalions on unplanned operational activity in the West Bank next year, at a cost of some 300 million shekels ($77 million). The first call-up orders for operational duty in the West Bank in January were received this week by four reserve battalions. But the 2016 plans drawn up by the Israel Defense Forces call for many other such battalions. The [Israeli] General Staff doesn’t know how long the current clashes with the Palestinians will last. But its working assumption is that many months will pass before the violence ebbs. If so, it will need many reservists, in part to replace regular troops so they can train as scheduled.